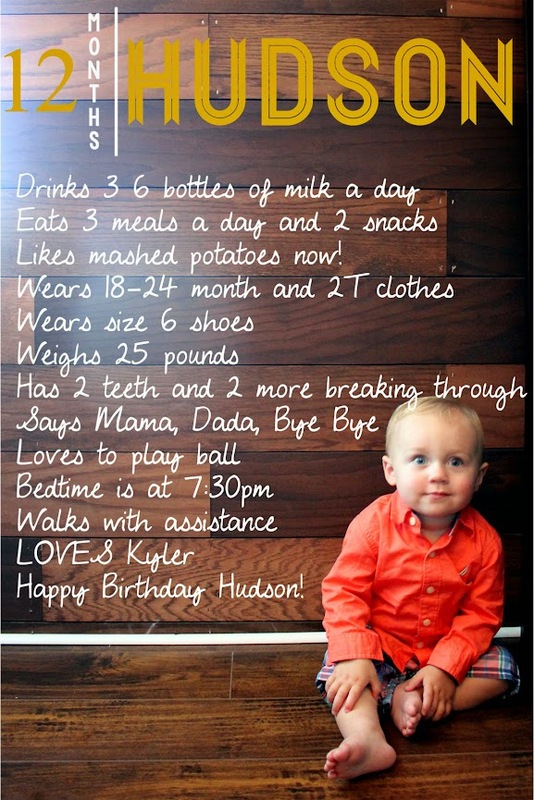 Hudson: Twelve Months/One Year/52 Weeks! Happy Birthday Hudson!!!!! Hudson is 1 year old today! 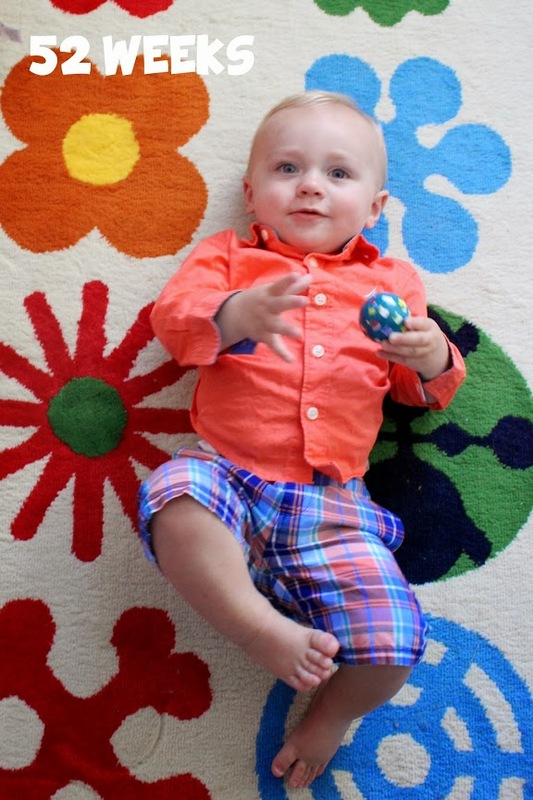 As you know, Hudson continues to be my little sweetie…. and such a FLIRT! He makes eyes at all the girls and the smile he gets on his face is just ridiculous! I mean I can’t blame the ladies for loving him…. just look at him! ❤ He is all about moving right now. He doesn’t sit still for a minute. He climbs, crawls, pushes, smashes and throws just about everything and anything. He LOVES to play ball and that seems to be his favorite right about it. He is also start to “chase” us which he thinks is hilarious. We tried mashed potatoes again the other day and he actually liked them! I think it was a texture thing and maybe he is over it? He still loves his steak, broccoli, yogurt, and applesauce. He gets by just fine with his 2 teeth. That, however, is about to change but 2 more teeth just broke through so I am thinking within the next month, he will have a few more. He is still taking his time in walking. He cruises around really well and flies when he pushing something. He can walk pretty good holding onto one hand of ours so I think it will be pretty soon. I also think that when he does figure out the balance piece, he will be quick. Ugh, he gets into enough now, I am sure that is only going to get worse. He LOVES to play ball right now. He has a pretty good arm too 🙂 He also LOVES his big sister Kyler. He thinks she is so funny and has a good time messing around with her. Which he does… already. I think those 2 will be BFF and fight like cats and dogs all at the same time. We head to the doctor for his 1 year check-up Friday but last time we checked he was right around 25 pounds. He also measured at 32.25 inches last time at the doctor so I will be eager to see if he has grown at all. He is wearing mostly 18-24 month clothes but can fit into a lot of 2T as well. His feet grew recently so we are in size 6’s now. Big guy! I am so sad our monthly/weekly photos are over, however, I am not sure how much longer I could have kept this up. He does not cooperate at all and it is so hard to get a good picture! Hudson, Happy Birthday sweet boy!!!!!! We love you!